A few weeks ago, I was talking with someone and they asked me what some of my "go to" dinners were. 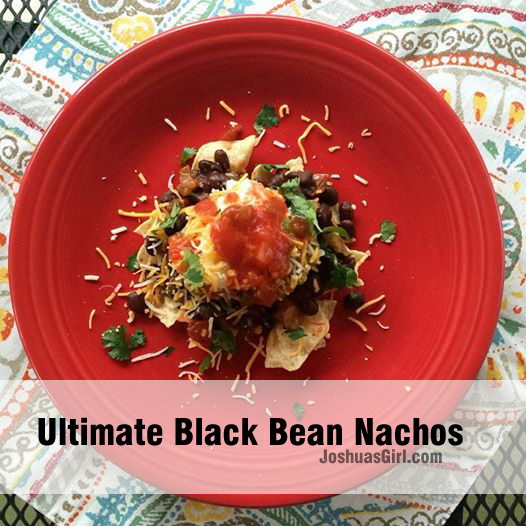 When one of my responses was Black Bean Nachos, they gave me a funny look. "Black Beans?" Bring first three ingredients to a low boil, then simmer for 5-10 minutes. Immediately serve on a bed of tortilla chips, then top with your favorite items. We love cheese, salsa, cilantro, sour cream, and guacamole! You had me at nachos :) I am always looking for different takes on homemade nachos, and this looks delish!! Delicious! Going to save and try these! Thanks. I think this sounds yummy! Will definitely be adding this to my menu soon. Thanks for sharing! My 4 year old son is obsessed with beans, LOL. I am definitely making these for him tonight since I already have everything in the house. Thank you for sharing! I loooove nachos! They have to be one of my fave night time snacks...nothing better when catching up on my shows! The black beans are a nice touch, I think it would add a great texture, and depth of flavor! Can't wait to try! YUM! Delicious and so simple! Sounds like a perfect quick and easy snack. My husband and I make nachos when we get a late night craving! Ooh that looks delicious and right up my alley! I love mexican, especially nachos and I make them all the time!